Climate change will put the squeeze on world’s wineries and wilderness. Could Merlot be growing alongside the moose of Yellowstone National Park soon or in prime panda habitat in China? A new study by a team of international researchers and led by Conservation International suggests that it could. Their key finding: climate change will dramatically impact many of the most famous wine-producing regions in the world today and prompt the opening of new areas to wine production in unusual places, which would likely degrade or put pressure on the critical natural capital and ecosystems that support species and human well-being. The study appeared today in the journal Proceedings of the National Academy of Sciences (PNAS) and is the first ever worldwide analysis of the impacts of climate change on wine production and conservation. It found that the area suitable for wine production will shrink by as much as 73% by 2050 in certain parts of the globe, with high potential for stress on rivers and other freshwater ecosystems as vineyards use water to cool grapes or irrigate to compensate for rising temperatures and declining rainfall. The researchers looked at nine major wine producing areas within the first global map of future winemaking using multiple models of wine suitability. The areas analyzed in more details are: California, Western North America, Chile, Mediterranean Europe, Northern Europe, Cape Floristic region of South Africa, parts of Australia with Mediterranean climate, parts of Australia with non-Mediterranean climate and New Zealand. Another key finding from the study is that new areas will become more productive, including parts of Western North America and Northern Europe. These places at higher latitudes and higher elevations will become increasingly suitable for wine making and sought after by vineyards as they search for the climatic conditions that are ideal for wine grape growing. This will have implications for conservation of wildlife and ecosystems in regions as diverse as the Rocky Mountains around Yellowstone National Park and Central China, where new vineyard suitability will open in the habitat of the endangered giant panda. Mature, producing vineyards have long-lasting effects on habitat quality for native species as they involve, for instance, removal of natural vegetation, spraying of chemicals and use of fences. According to the study, the greatest area of increasing wine production suitability is in the Rocky Mountains near the Canadian-US border, putting at risk species such as the grizzly bear, grey wolf and pronghorn. “Climate change will set up competition for land between agricultural and wildlife – wine grapes are but one example. This could have disastrous results for wildlife. Fortunately, there are pro-active solutions. We are creating incentive-based programs with private landowners to provide wildlife habitat as we expand our capacity to feed a growing planet in the future under a changing climate.” said co-author Dr Rebecca Shaw, a climate scientist and associate VP for the Environmental Defense Fund’s Land, Water and Wildlife program. 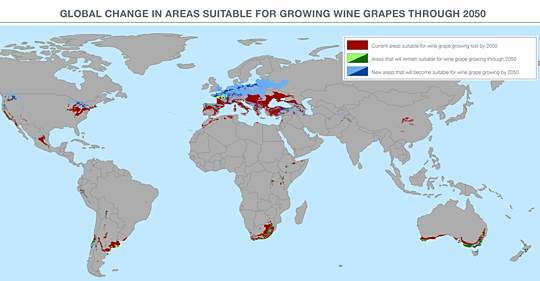 There is a Google Earth Flyover of the of the world map showing areas suitable for growing grapes in 2050 here and you can read a blog from the paper's lead author here.